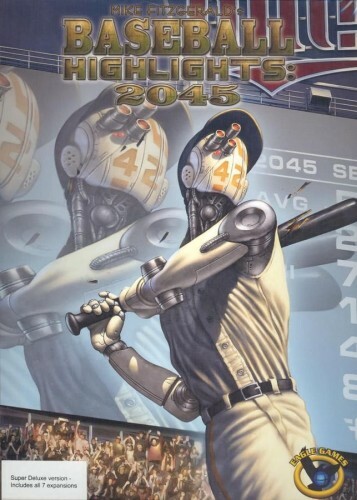 Baseball Highlights: 2045 is like watching TV highlights of early 21st-century baseball games, with the gameplay being full of theme with no outs or innings and without bogging down in a play-by-play baseball simulation. In this quick and interactive game, two players build their teams as they play, combining both strategy (building your team) and tactics (playing the game) without any of the downtime. Game includes regular head to head play as well as solitaire and 3 player variants and the means to play 4 player tournaments. The game also supports combining boxes for even larger tournaments. 1-4 players 45 minute play time. The Super Deluxe Edition comes with seven mini expansions: Magna Glove, Pitches, Cyborg Hitters, Robots Rally Cap, Coach, Big Fly!, and Errors!. Baseball Highlights 2045: 7-Card Promo Pack Includes: 2 Travel Stadium Cards, 1 Mordecai Marichal Card, 2 Kris Correa Cards (1 Foil), 2 Wiffle's Revenge Cards (1 Foil). The Ballparks Expansion adds 10 cards that provide a new game mechanic, Home Ballpark. 15 new cards for the Free Agent Deck. This expansion does not provide any new Immediate Actions. However, it does introduce cards with two Immediate Actions. These cards are more flexible, but generally have stricter conditions for them to take effect. Some cards will not be able to be played for both effects. 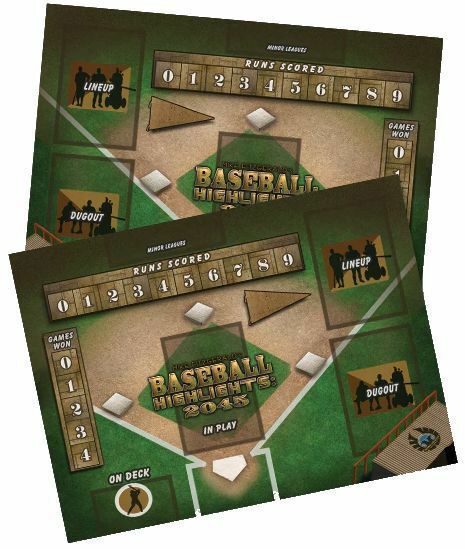 Baseball Highlights: 2045 – Spring Training is an introductory version of Mike Fitzgerald's highly acclaimed deck-building game Baseball Highlights 2045 with an updated, revised and expanded rulebook, step-by-step play examples, and a reference guide. 15 new cards for the Free Agent Deck. This expansion adds new Immediate Actions for the Home Team as well as for Extra Innings.